The Agha Khan museum is located in North York, just outside of Downtown Toronto. 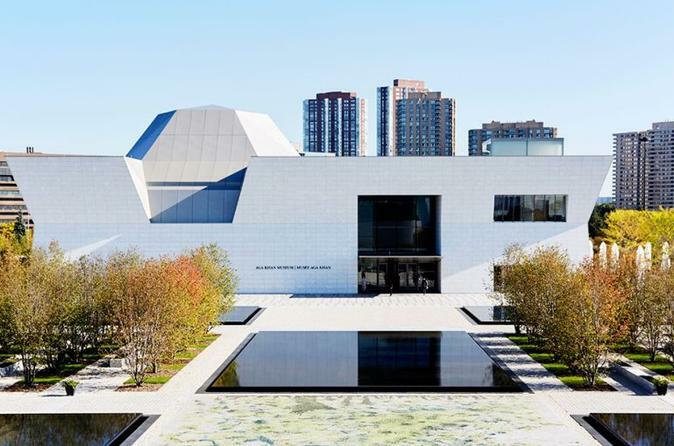 This new and modern museum isn't easily accessible by public transit so with this tour, enjoy Aga Khan Museum admission tickets with round-trip shuttle service from any hotel in downtown Toronto, Markham, North York, or Richmond Hill Hotel. Your expereince begins with pickup from your hotel between 10am and 10:30am. The Aga Khan Museum was designed by Fumihiko Maki, winner of the Pritzker Architecture Prize, who used light as his inspiration. He structured the building in a way that ensure that light would be ever present. Depending on the season or time of day, light will animate the building in numerous ways, including throwing patterns on walls, enhancing interior spaces, or illuminating the open roof courtyard. The museum contains an impressive variety of spaces, including two exhibition galleries, areas for art conservation and storage, a 350-seat theater, and two classrooms. Within an his contemporary design, Maki incorporates historical elements originating in Islamic cultures, building bridges between eras as well as civilizations. See this museum and travel easy with round-trip transportation all taken care of for you so you can focus on the harmonious contemporary and historical components of the Aga Khan Museum.